Sony has embraced Disney's Frozen fever by announcing a limited edition PS4 console featuring the main characters on the hard-drive bay cover. Two things kids love are Disney and games consoles – and Sony knows it. That's why to coincide with the DVD and Blu-ray release of Frozen, the highest grossing animated film of all time, Sony is releasing a Frozen-themed PS4. Sadly it won't make it to UK shores and will only be released in Japan, where the animated film has been a huge hit. 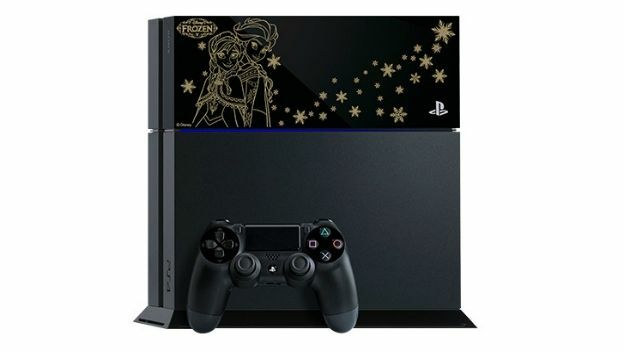 The black console adds a special golden print depicting Anna and Elsa, the two sisters from the film tipped off with some snowflakes. It's also bundled with a DualShock 4 controller and a headset, but oddly doesn't include a copy of the disk in the box. Its due to be released in Japan on July 16 42,980 yen (£250) and Sony is taking pre-orders now. Starring Kristen Bell and Idina Menzel, Disney's animated movie Frozen has earned more than $1.2 billion at the box office and has won two Academy Awards. The Frozen soundtrack has since become the biggest-selling movie album since Mamma Mia! in the UK. Over the last couple of weeks, the Wii U outsold the PS4 and last week it only outsold the PS3 by only 500 units. In addition to being able to use external hard drives on PlayStation 4, PS4 Pro owners also get access to games-enhancing "Boost Mode"